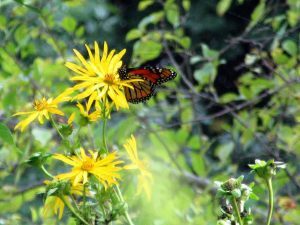 “Yesterday, the National Fish and Wildlife Foundation released its grant slate for this year’s Monarch Butterfly Conservation Fund. The Fund awarded 23 grants for $3.7 million with an additional $5.8 in matching contributions, generating more than $9 million for conservation. Of those awarded, several projects highlight the work of Monarch Joint Venture partners…. Monarch butterfly nectaring on a native Cupplant (Silphium perfoliatum). Click to see the video. The Foundation’s Monarch Butterfly Conservation Fund is a public-private partnership between the U.S. Fish and Wildlife Service, Monsanto, the U.S. Forest Service, the U.S. Geological Survey, the Bureau of Land Management, and the U.S. Department of Agriculture’s Natural Resources Conservation Service. This is the third year the Fund has awarded projects. Be sure to check with grant recipients in your state to see how you or your organization can become involved.